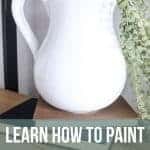 Learn how to make a white farmhouse pitcher for a fraction of the cost using a tacky thrift store find! 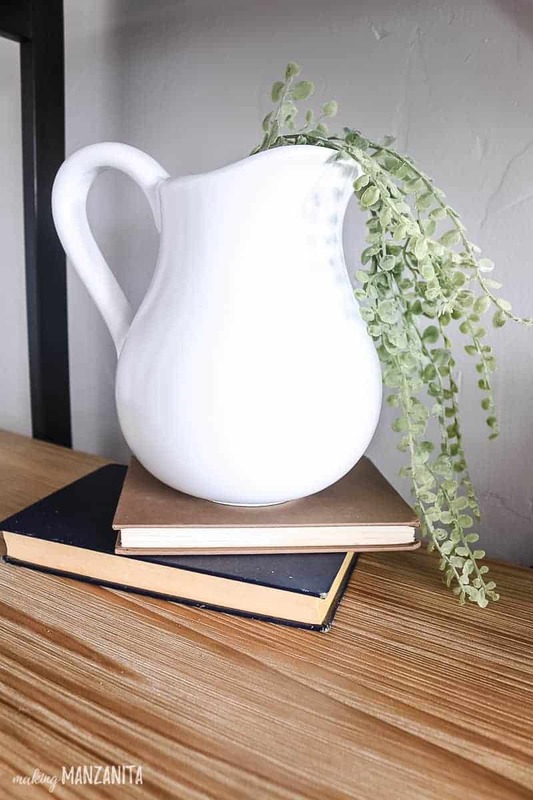 If you love the farmhouse style, you’re going to love this DIY farmhouse pitcher tutorial. 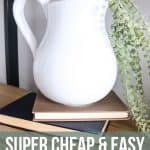 This white farmhouse pitcher post contains affiliate links, but nothing that I wouldn’t wholeheartedly recommend anyway! Read my full disclosure here. The only thing I requested this year for Christmas was this shelving unit that I literally have been eyeing for over a year. I never had a good spot for one, but we recently completely changed the furniture arrangement in our living room and BOOM! There was a huge open spot that was dying for some shelves. My wish was finally going to come true. Some cute shelves to decorate to my heart’s content. 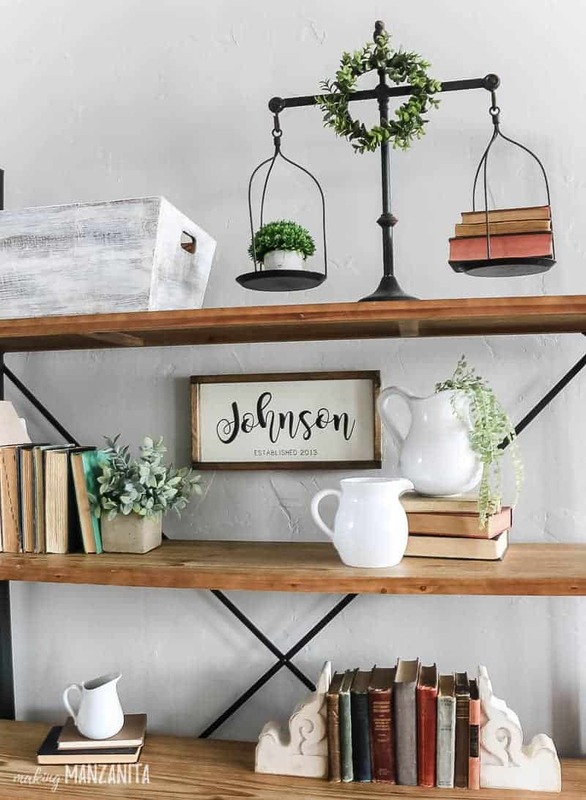 If you’re stuck on how to decorate shelves, be sure to check out this post with tons of shelf styling tips and tricks! One thing I knew I wanted on my new shelves was a white farmhouse pitcher or two. But they range from $15-$30 to buy new….I had to do better. And then I came across these two beauties at the thrift store…. and when I say beauties I really mean….super tacky and dying to be upcycled pitchers. 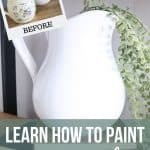 I instantly thought of my painted mason jars and figured that if I could paint glass mason jars I could definitely paint ceramic pitchers. Except this time I went with spray paint. 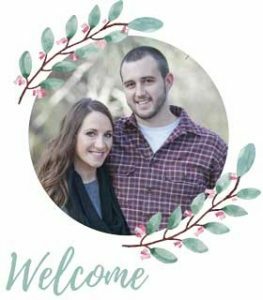 I knew they would be perfect for this thrift store challenge with some of my favorite blogging friends! 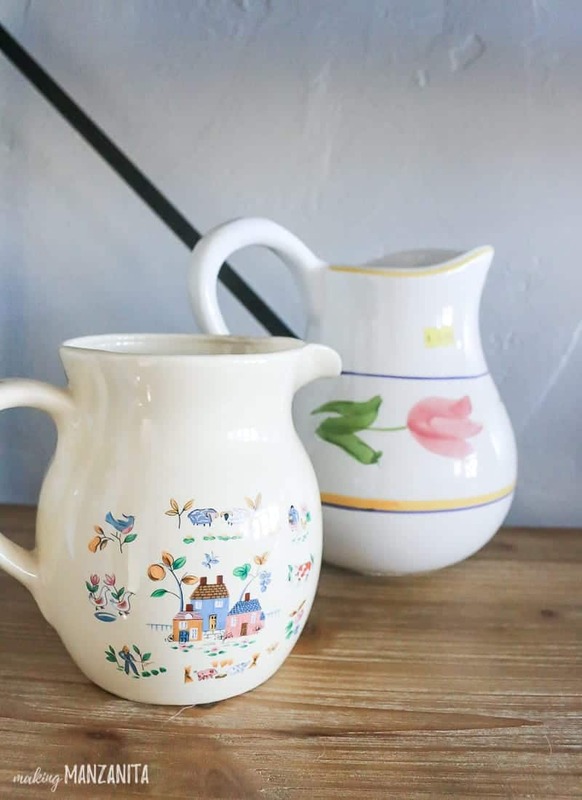 I’m going to show you how to turn tacky thrift store pitchers, like these, into farmhouse pitchers that you’ll have so much fun decorating with! 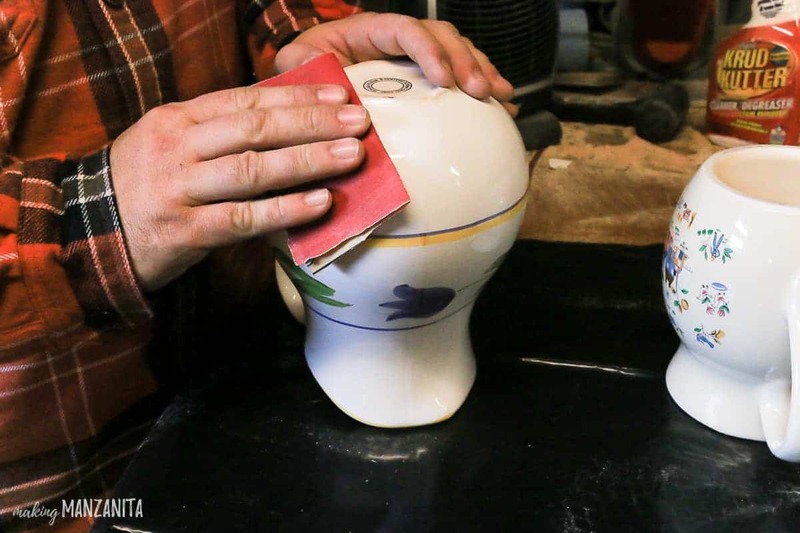 First you want to VERY lightly sand the pitcher with a fine grit sandpaper. You could even probably use steel wool as an alternative. All you really want to do is create a slightly rougher surface for the paint to stick to. 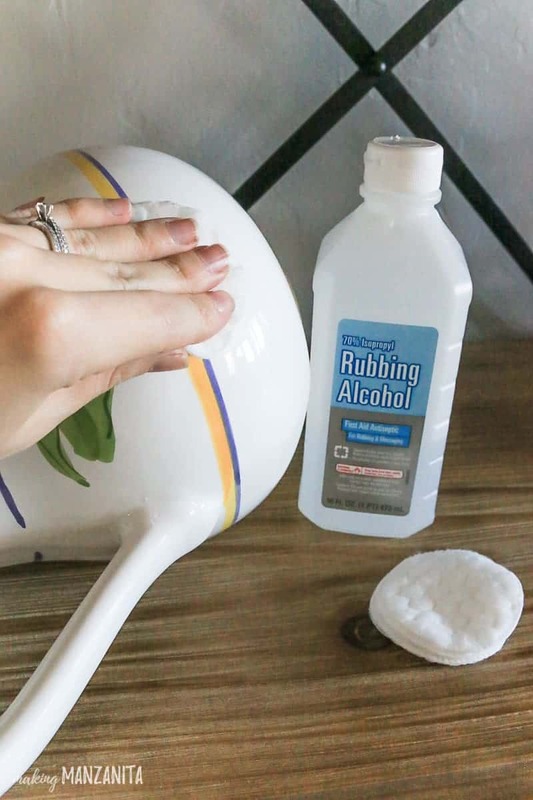 Next, grab a cotton round and some rubbing alcohol and clean the pitchers well. This will clean off any dust created from sanding or also remove any dirt, grime or oils from your hands. Even though the spray paint I was using had primer in it, I decided to also use a flat white primer first. This just helped with coverage so I didn’t have to do as many coats of the white spray paint. The photo above shows the pitcher after 2 coats of primer. You can very slightly see the old design in the background. After the 2 coats of primer, I moved right on to spraying the farmhouse pitcher with this white spray paint. 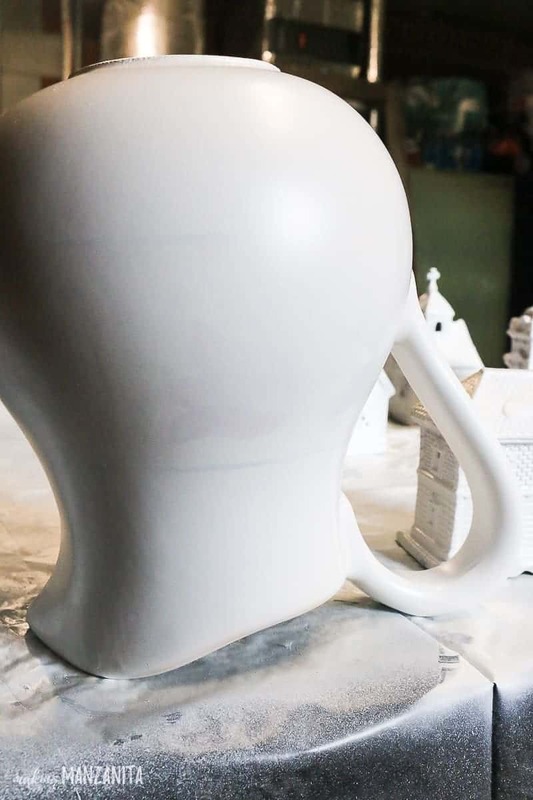 I chose a high gloss spray paint so that the finished product would look more realistic….because a white farmhouse pitcher usually has some shine to it! 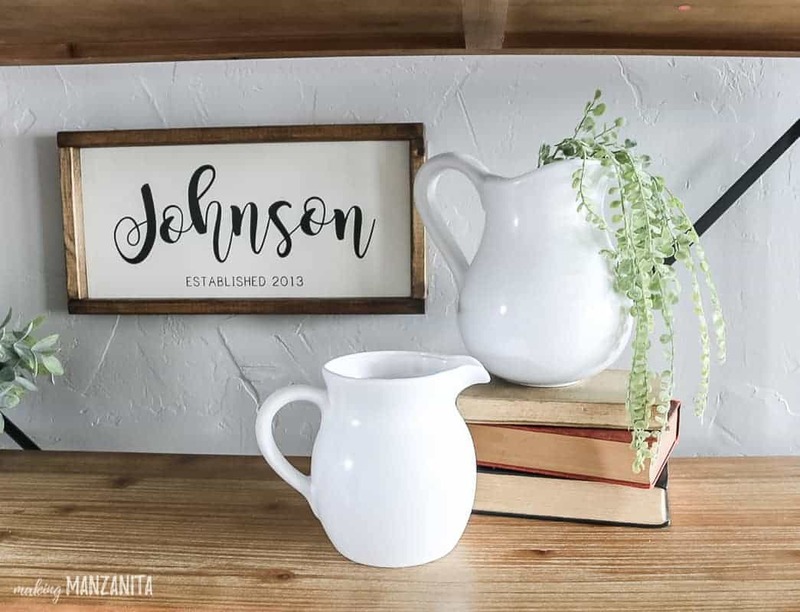 Decorate with your white farmhouse pitcher. 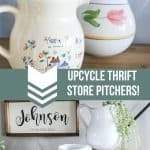 Now you can literally take your finished pitcher and decorate to your heart’s content! I love the extra farmhouse charm they added to my shelves! The two pitchers that are sitting together on the 2nd shelf are the ones I painted. The other smaller pitcher is one that I purchased new….can’t really even tell the difference, right?! 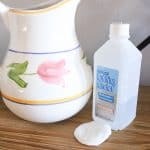 I love that I was able to create a budget friendly alternative to the pricey pitcher with just simple spray paint! 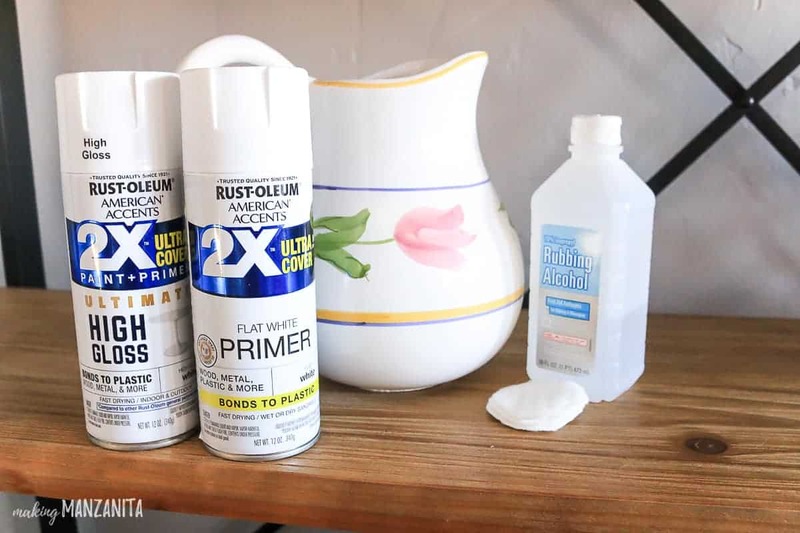 Spray painting thrift store items is one of the BEST crafting projects if you are a beginner. They rarely cost much (I paid $7 total for both pitchers) and spray paint is also very affordable (usually about $3-4 a can). So there is no pressure…if you make a mistake, no problem! Once you get more confident with painting, you can also try fun things like painting with chalk paint (like this vintage bread box or barstools) or a dry brush technique like I did on this outdoor bench. 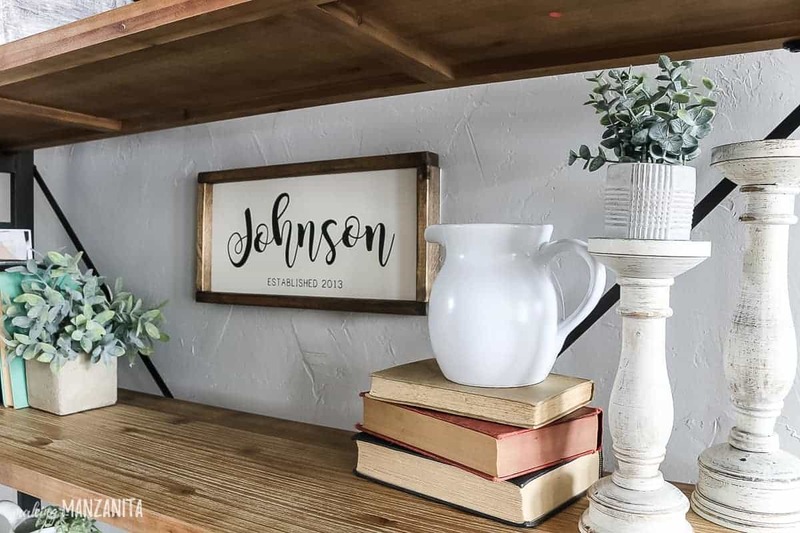 Where would you put a farmhouse pitcher in your house? 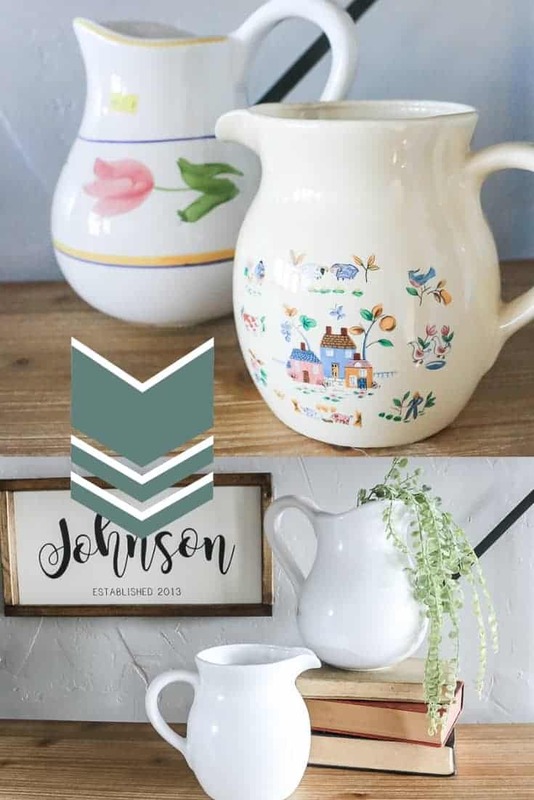 Further Reading – Looking for more farmhouse style thrift store upcycle projects?? Did you paint the inside as well? If so, did you just spray it in there or use a certain technique? I didn’t really worry too much about the inside. They were both a lighter color to begin with so it wasn’t too noticeable. I just sprayed the top of the inside where it was visible. Rather than using sandpaper or steel wool, have you ever tried using Etching cream? I love this stuff and although it seems somewhat expensive the first time you buy it, it’s reusable and lasts a very long time. You can use it on any glass surface. After applying it, you leave it on for 15- to 20-minute intervals, then scrape it off and back into its container. If it’s not as frosted looking as you want, reapply it and check again in another 15- to 20-minutes. BIG CAUTION though–do not ever, EVER rinse it off in a porcelain sink because it will strip the finish right off of your sink. I thought I’d rinsed the piece I was working off well enough outside, brought it to my sink to soap-wash it and completely ruined my sink. Now I do an initial thorough rinse outside, then thoroughly rub baking soda all over the wet piece, rinse again and reinspect the piece to make sure there’s no cream hiding in any corners or debossed areas. If there are, I reapply the baking soda and scrub again (the baking soda deactivates the acid etching properties of the cream. My favorite product is Armour Etch. Give it a try; I’m sure it will save you not only time, but also avoid any possible breakage you might incur from the sanding process.